“Parma” — is a Russian professional men's basketball club from the city of Perm, founded in 2012. 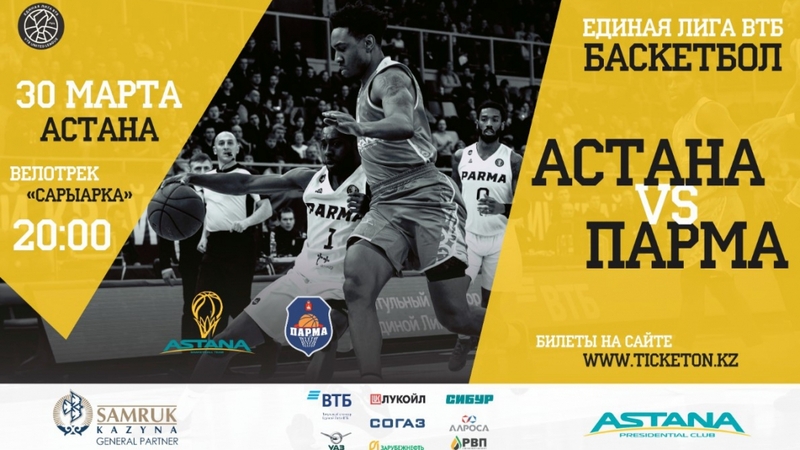 The teams met exactly a month ago on February 27 in the city of Perm, and then the capital club «Astana» defeated “Parma» with a final score of 80:85. Today, “Parma” basketball team closes the penultimate line in the VTB United League standings, with only 4 wins in 21 games. Despite the defeat in Khimki, last Monday, “Astana” maintained a positive balance of victories and defeats (13-8) and the sixth position in the standings. We are waiting for all our dear fans on March 30 in the stands of the Republican cycle track “Saryarka” (Kabanbai Batyr Ave. 42), the match starts at 20:00 Nur-Sultan time. Tickets for the match are already on sale on the website Ticketon.kz. Live broadcast of the match will be available on our website in the Match Center section and live on QAZSPORT TV channel.